Notes: Based on a series of novels by Yoshiyoka Hitoshi. Growing up in a Trekkie household, I found Tylor to be the perfect yin to Star Trek's yang. Tylor, quite simply, is the anti-Kirk, and it works beautifully. This series is one of the most beautiful productions I have ever seen, and is the perfect blend of comedy and drama, with even the most minor of characters fleshed out. From what I understand, this series was a labor of love ... and it shows. For the space opera genre, which often takes itself way too seriously, it's refreshing to see a takeoff on it that isn't overtly slapstick. Instead of going for sight gags and below-the-belt humor, the writers go for wry, witty dialogue, and allusions to many a classic science-fiction novel and movie. The situations, while unbelievable, are still plausible ... they really could happen in battle, and you never really figure out whether Tylor is along for the ride or really IS the great tactical genius in military history. In short, Tylor is a smart spoof that stands up quite well on its own. 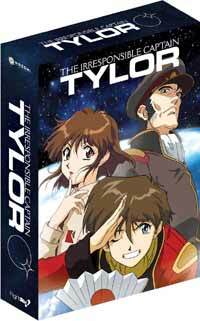 With an engaging plot, wonderful characters, well-rendered world-building, and surprisingly sympathetic "bad guys", Tylor will still be as fresh years from now as it is today. Recommended Audience: Probably not the best idea for children, but they wouldn't catch the sci-fi in-jokes anyway. If you know any Trekkies or Red Dwarf fans who haven't seen any anime, give them this series as a starter - they'll be rolling on the floor in no time.